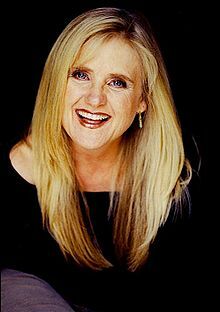 Nancy Campbell Cartwright (born October 25, 1957) is an American film and television actress, comedienne and voice artist. Noted for her long-running role as Bart Simpson on the animated television series The Simpsons, she also voices other characters on The Simpsons, including Nelson Muntz, Ralph Wiggum, Todd Flanders, Kearney and Database. Quoted in Knutzen, Eirik ((2002-08-18)). "Voice behind Bart Simpson also lends her animated talents to other TV shows". The San Diego Union-Tribune. In reference to voicing characters in Rugrats, whom she considers the most difficult. The best acting job in the world. Quoted in Brockes, Emma (2004-08-02). That's my boy. The Guardian. Retrieved on 2009-02-05. Referring to her role as Bart Simpson. Quoted in And speaking of the Simpsons. Edinburgh Evening News (2004-08-12). Retrieved on 2009-02-07. Quoted in Olshansky, Elliot (2009-01-28). Bart Simpson's voice being used to promote Scientology event. New York Daily News. Retrieved on 2009-01-28. Cartwright promoting a Scientology event via a robocall. Devious, underachieving, school-hating, irreverent, [and] clever.